Please note: Before being shipped, the worms are non-chemically treated to slow or completely stop the cocooning process. Waxworms are caterpillar larvae of wax moths and are medium-white caterpillars with black feet and small brown or black heads. 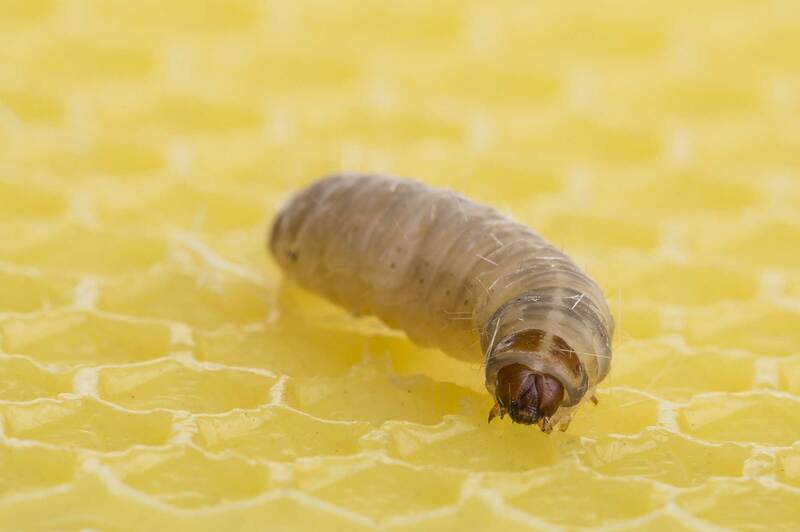 They get the name waxworms from their ability to eat beeswax, as they are a parasite in bee colonies in the wild. Beekeepers consider them pests because the wax moths will feed on the wax used by the honeybees to make the comb of the hive. When kept in captivity, waxworms can live a long time without food, especially in cool temperatures. When held in captivity, waxworms can be fed grains, bran and honey. Waxworms make an excellent food source for many reptiles, amphibians and some pet birds. They have a very high fat content making them perfect for a lot of reptiles nutritionally. Waxworms are also very easy to breed and take care of, able to survive for a long time at lower temperatures. Store worms between 55°-60°F. Most refrigerators are too cold to store them in, but the refrigerator door is a little warmer and will usually work fine. They will keep for up to a month or two if kept at proper temperatures. When purchased, our worms will generally be a small to medium size. As they grow, the worms will spin webbing throughout the medium; simply pick through and pull out the worms as needed. Once mature, some of the worms will move to the top of the container to pupate. These worms have reached their full size and should be used first. If desired, worms can be left to pupate into moths. The moths make excellent food for some arboreal animals that are reluctant to feed at lower levels. Cultures should be kept at room temperature, below 75°F. The worms will grow to a larger size, and at a faster pace if kept at 80°-88°F.